Our favorite funk fools, Lettuce, are throwing their second annual Fool’s Paradise festival at the end of the month in St. Augustine, Florida, and Lettuce tell you just how funkin’ excited for the shenangians that will take place in just 24 days. If this year’s Fool’s is any like last year’s, we are sure in for a funk load of great music, collabs, surprises, laughs and funky vibes. The lineup features two days of the best in funk and new age grooves in one of America’s most historic Floridian cities. 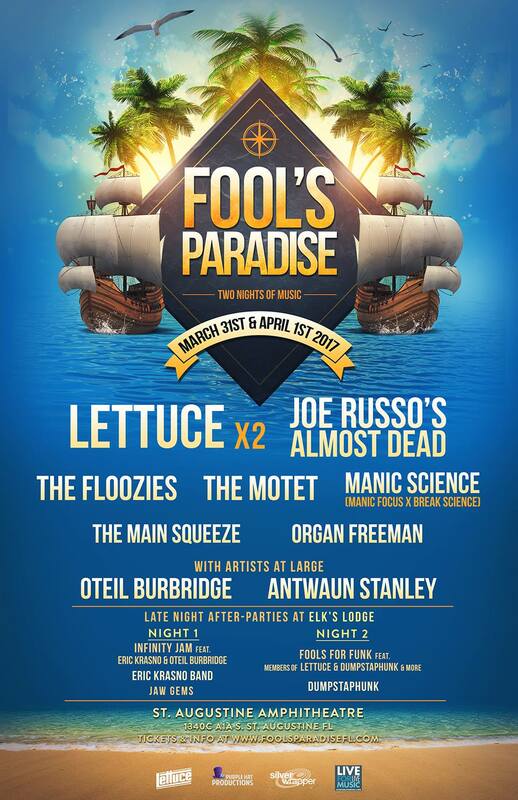 Boasting a stellar lineup (peep below), two epic late night Official Afterparties at Elk’s Lodge, Artist excursions with members of Lettuce and more, Fool’s Paradise is the mecca for all Lettuce and funk fools alike March 31st and April 1st. Night one Afterparty will bring the “Infinity Jam” feat. Eric Krasno & Oteil Burbridge and night two hones the return of “Fools For Funk” feat. members of Lettuce & Dumpstaphunk, JAW GEMS, and more (DAYUM!). To make things even more funkin’ amazing and intimate, fans have the chance to buy tickets for special Saturday adventures with different members of the band. This year, sail with The Shady Horns (Eric “Benny” Bloom & Ryan Zoidis) for a DJ set @ sea, Ping Pong it up with Adam Deitch and Adam “Shmeeans” Smirnoff or Putt-Putt golf with the bass slayer himself Jesus Coomes, Antwaun Stanley and The Motet’s Lyle Divinsky. Tickets are limited and will go quickly for these once in a lifetime opportunities so read more and grab your pass here.